What is the role of private military security contractors (PMSC) in international war today? At the beginning of the War on Terror there were an innumerable amount of private security personnel working for the United States in Iraq and Afghanistan. On October 23, 2014, a jury convicted four former Blackwater (now known as Academi) security personnel of first degree murder, voluntary manslaughter, attempted manslaughter, and using military firearms in the commission of a felony. These convictions send a message that the actions of PMSCs can incur criminal liability for their actions. The role PMSCs play in international conflicts is very important. They often do work that active duty military cannot do because of various international law constraints, they often have military training themselves, but are often not held by the same international law standards due to the status of forces agreements (SOFA) that they operate under in the host country. These agreements often afford PMSCs immunity under the domestic laws of the host country. This case featuring the four former Blackwater operatives is of great importance because it is the first instance that puts limits on the activities of the PMSC’s. 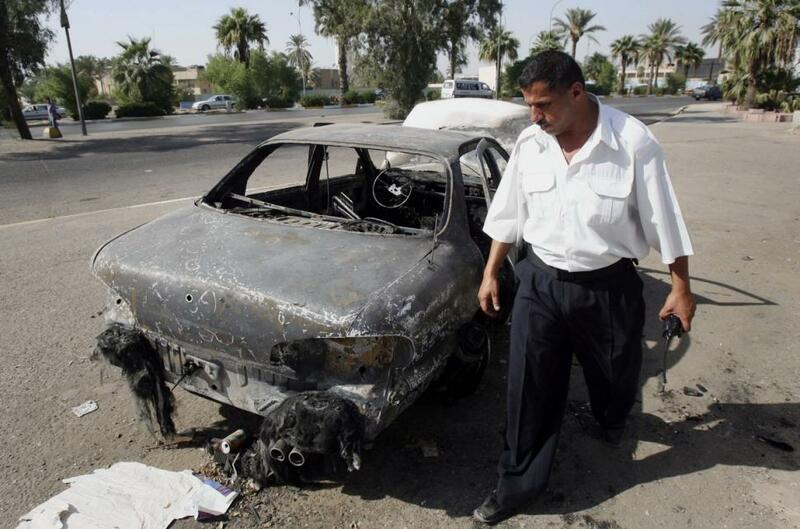 An Iraqi traffic policeman inspects a car destroyed by a Blackwater security detail in al-Nisoor Square in Baghdad, Iraq in 2007. A federal jury in Washington convicted four former Blackwater security guards on trial in the shootings of more than 30 Iraqi citizens in the heart of Baghdad. In 2007 four Blackwater operatives killed 14 unarmed Iraqi’s, largely women and children. At the time of the incident the US refused to allow the Blackwater employees to be tried by the Iraqi justice system. They were brought back to the US to stand trial here instead. The first trial was dismissed by the judge based on the unconstitutional collection of evidence. In terms of US-Iraqi diplomatic relations the mistrial was the second blow. First, the US protected the Blackwater employees by bringing them back to the US for trial. Second, when they did face trial, it was inconclusive. To the Iraqis this likely seemed as if the US was condoning the Blackwater employee’s actions, as there was no justice for those that were killed. At the conclusion of the second trial on October 22, 2014, there was little rebounding from the presumption that the US did not really intend to punish the Blackwater employees. In response to this daunting assertion, US attorney in Washington, DC said that this verdict “is a resounding affirmation of the commitment of the American people to the rule of law, even in times of war.” Holding these security contractors accountable, even seven years later, will hopefully bridge the diplomatic differences exacerbated by this incident. 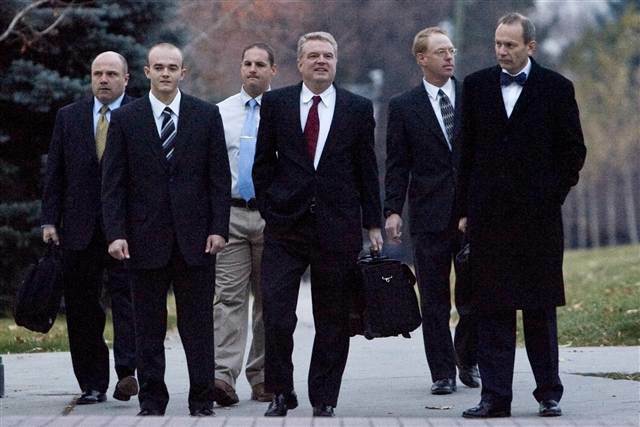 Former Blackwater Worldwide security guard Nick Slatter, second from left, and Donald Ball, third from left, arrive with their lawyers at the U.S. District Court before surrendering to authorities in Salt Lake City, Utah, in Dec. 2008. What Role Will PMSCs Play in International Conflicts in the Future? The true question is what legal status should PMSCs have in future international and non-international armed conflicts? In this case, the lack of international legal status is likely what caused the most diplomatic strife. These men are American citizens, but they are not American military. They do not report to the Department of Defense, the Uniform Code of Military Justice, and the US enters into agreements with the host government that waives the applicability of host country domestic law for their actions. 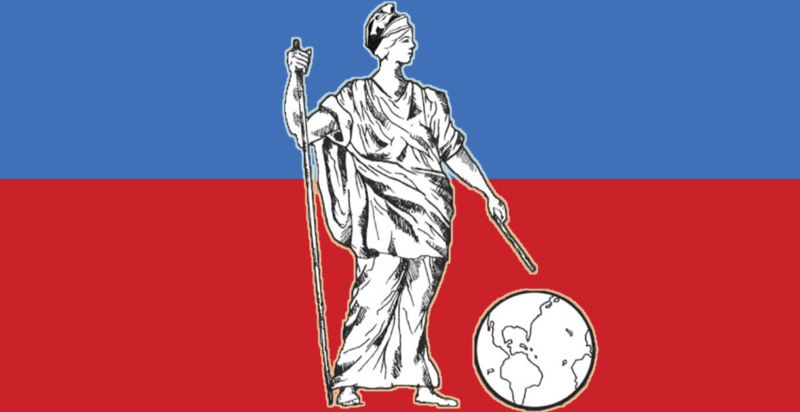 PMSCs are private American citizens employed by the Department of State. PMSCs operate in a legal vacuum. Prior to these convictions, legal precedent was unclear as to what law applied to private citizens committing criminal acts in foreign lands. There is still not a clear legal direction as to what status PMSCs hold when they are acting in a foreign country. This could be further muddled if distinguishing between the types of conflicts that PMSCs are participating in, whether or not they are working overtly or covertly, and who has hired them (the United States government or other nations). In the second installment of this blog post, however, I will delve further into the legal status PMSC’s should have when acting within various types of international conflicts based on the legal precedent set by this case. While legal precedent is important, it sometimes works much slower in the real world than public policy could work. The Iraqis doubted the US commitment to bringing the Blackwater employees to justice for their attack on unarmed Iraqi civilians. This ruling is a palpable step towards establishing a barrier between acceptable and unacceptable behavior of private citizens acting in a war zone. Although the Iraqis may not have their full faith in the US justice system restored after waiting seven years for a ruling, this is indeed a positive step in showing the world that we are willing to hold these private citizens accountable for their actions. This could, and hopefully does, show the world that the US does not think it is completely above the law – foreign or domestic. Legal precedent is important and actively developing due, in large part, to this case. In the meantime, the evolving public policy will hopefully calm any remaining diplomatic strain stemming from this incident. Further, it should remind the international community that the US is taking responsibility for the actions of their PMSCs and, while it took some time in this case, impunity will not carry on into the future. In Part Two of this blog post I will discuss the legal standards that should be applied to PMSCs in different types of international conflicts. Justine Drennan, Four Blackwater Guards Convicted of Killing 14 Unarmed Iraqis, Oct. 23, 2014 http://thecable.foreignpolicy.com/posts/2014/10/22/four_blackwater_guards_convicted_of_killing_14_unarmed_iraqis. Dwyer Arce, Federal judge dismissed charges against indicted Blackwater guards, Jan. 1, 2010 http://jurist.org/paperchase/2010/01/federal-judge-dismisses-charges-against.php. Matt Apuzzo, Blackwater Guards Found Guilty in 2007 Iraq Killings, Oct. 22, 2014 http://www.nytimes.com/2014/10/23/us/blackwater-verdict.html?ref=middleeast&_r=0. Categories: international law | Tags: Academi, Blackwater, Department of Defense, Department of State, IHL, International Humanitarian Law, international law, Iraq, Law of Armed Conflict, Law of War, PMSC, Private Military Security Contractors, SOFA | Permalink.